Donald Hebb Rumsfeld (born 9 July 1932) is a United States businessman and politician. 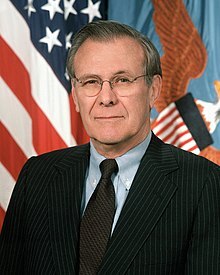 Rumsfeld was the 13th United States Secretary of Defense under President Gerald Ford from 1975 to 1977, and the 21st Secretary of Defense under President George W. Bush from 2001 to 2006. He is both the youngest (43 years old) and the oldest (74 years old) person to have held the position, as well as the only person to have held the position for two non-consecutive terms. 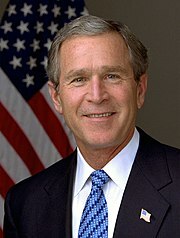 Rumsfeld is also the second longest serving Secretary of Defense, behind Robert McNamara.